Bluetooth wireless keyboards are still a rarity and that’s a bit weird given how huge the mobile market has grown, but still there are some options to get typing quickly on your phone. This one however is probably the most portable keyboard we have ever seen. With a neat sliding mechanism right in the middle, this keyboard, romantically named the Elecom TK-FBP049E, splits in two and folds into a package as small as the phone itself. Unfold it and it doubles as a phone stand. Of course, it works with all devices supporting Bluetooth, be it the iPhone, an Android, Windows Phone or any other smartphone. The little keyboard is powered by a single AAA battery, that would keep it running for 8 months. It comes in both a black and white version. Should you buy it? The answer is probably no as it costs a whopping $182, and you’d have to ship it from Japan. Still, the idea is definitely inspiring. I might just invest in that. Thanks for the link. 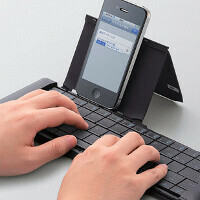 what is the cost of the amazing jorno keyboard?? Looks like it started at $79. Retail is $119. I am trying to see the compelling value proposition for the Elecom keyboard. If all that was available in the phone market was an iPhone-sized (3.5 inch) touch screen, there would seem to be a fairly compelling value proposition for users with large fingers and thumbs. But as larger screen sizes become the norm, the value proposition for the Elecom diminishes. If the Note II meets its goal of 20+ million sales, it would seem that the combination of a larger screen size plus stylus would pose a serious challenge for the Elecom. Worth no more to me than $69.99 -- maybe up to $99.99 including an early adopter tax. Too Bad phones don't do computer like things. So the keyboard is worthless. What's next? A folding mouse to go along with it. Huh? What is e-mail? One of the claimed value propositions of the Surface tablets is the ability to create Office files. And, and, and. More and more functions of a traditional office-based PC are being migrated to a tablet form factor. There are just other alternatives available to consumers.